When it comes to heartbreaking stories in the world of guitar, there aren’t many that can match that of legendary guitarist, Jason Becker and his over 25-year-long battle with ALS (Amyotrophic Lateral Sclerosis). At just 16-years of age, Becker became a part of (along with fellow virtuoso Marty Friedman) the Shrapnel Records-produced duo Cacophony releasing the records, Speed Metal Symphony in 1987 and Go Off! in 1988. The pair would split later that year, which would lead to the release of Jason’s first solo album Perpetual Burn, also through Shrapnel. By 1990, Becker would become a part of David Lee Roth’s solo band as lead guitar player, following in the footsteps of Steve Vai. However, shortly after he got the gig, he was diagnosed with ALS, and given just 3 to 5 years to live. Becker was able to finish the recording of Roth’s third full-length studio album A Little Ain’t Enough, but was unable to make the tour due to his rapid physical decline, that would eventually rob Becker of his ability to speak or move. Today, Becker has defied medical odds by surviving decades longer than first predicted. He communicates with a system designed by his father, Gary, where Becker uses his eyes to “spell out” what he wants to say by looking at letters on a letter board, with a caregiver saying the words for him. This has even led to him now composing music with the assistance of a computer program and collaborators, with three new tracks (he wrote post-diagnosis) featuring on his 2008 album Collection. Check out the two video clips below to see fantastic footage of Jason Becker one year before he would sign with Shrapnel. 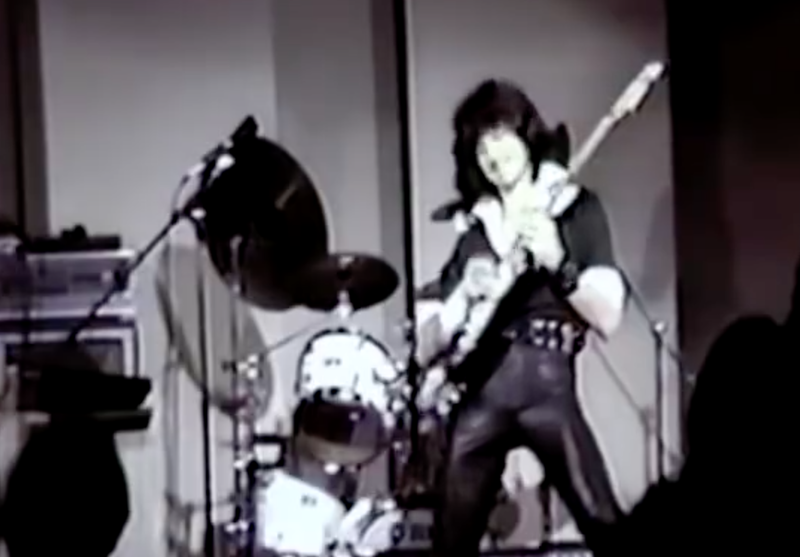 The clips appear to have been shot during a high school talent show, with Becker showing his incredible soloing ability in front what seems like a pretty stunned crowd in the first, and covering Yngwie Malmsteen’s “Black Star” in the second.